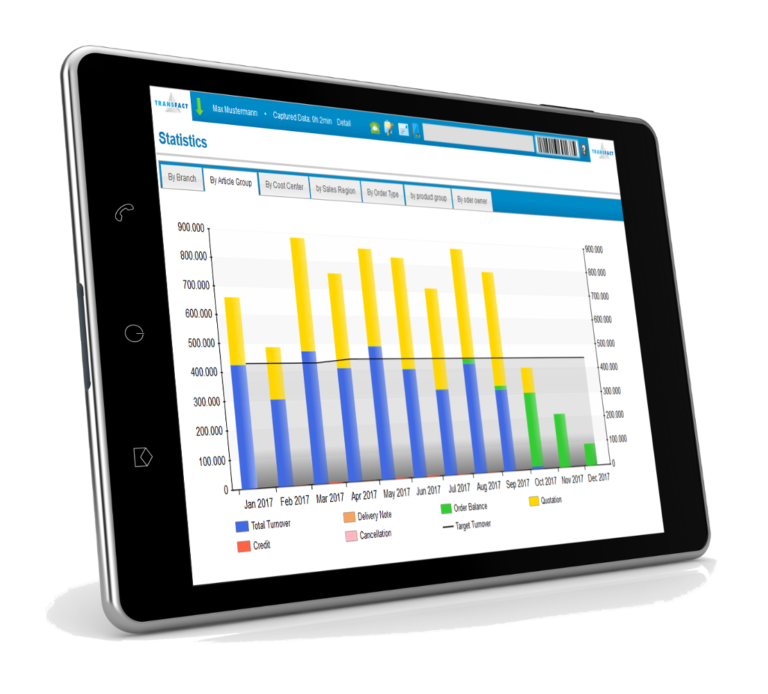 Make the most out of the data gathered by the system with customisation reports and Key Performance Indicators. Data collection is the first step to transparency, the second and even more crucial step is analyzing the data you’ve collected so it can help you make better decisions when looking for ways to improve your company. 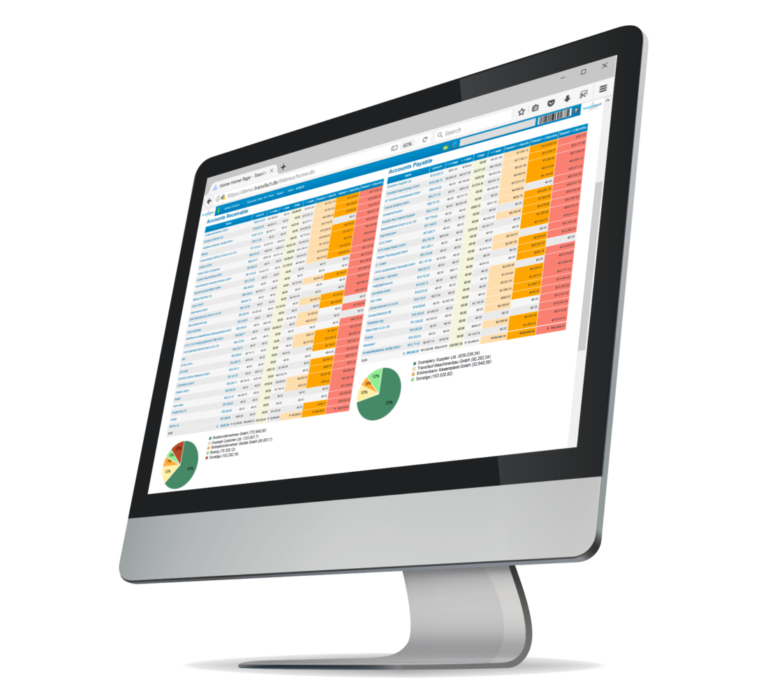 The Transfact KPI Reports provide you with multiple graphs and tables in different areas, that show you some of the most common and relevant Key Performance Indicators in each area that summarise the data in the system in clear and useful overviews. 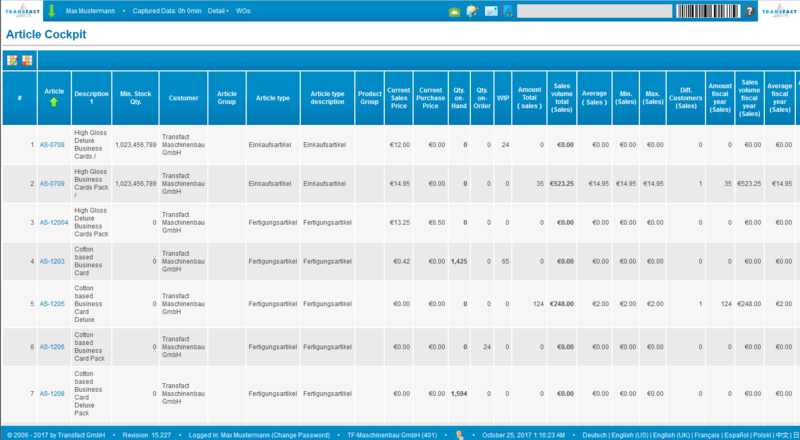 The Transfact ERP System is able to track very detailed information about your company for you. Use this data to your advantage: analyse it so that you can base future decisions on accurate numbers that come out of your own organisation. The KPIs and Reporting Module of the Transfact System has been created so that our customers make the most out of the transparency of the system. The Data in the Transfact Data Base belongs to you and it is for your use. Therefore, all our reports and tables are easily exported, so that you can continue your analysis and make the most use of your data. You can export the Transfact Data from any of our tables in full or using the built-in filters and you can choose to export it into either csv or excel and in some cases xml files. Often times our customers need very specialised KPI and Reporting solutions. Since each organisation is different, Transfact also offers customised reports that can be either external or directly integrated into the system for frequent use. 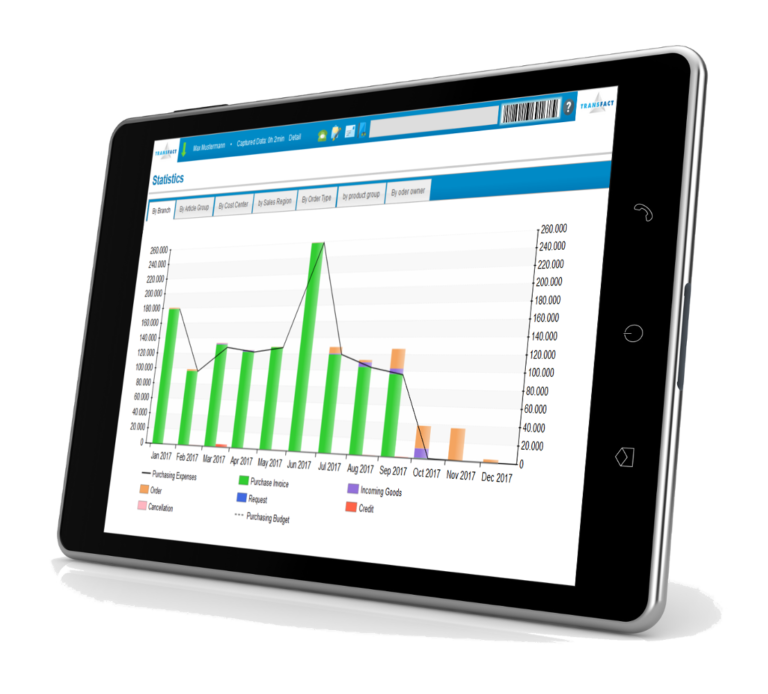 Display your data exactly how you need it, contact our services team and let us help you build the reports that will support your growth. Get an overview of down time, productivity, distribution of setup and execution times, idle times and times spent on rework processes. Display the results daily, weekly, monthly or yearly depending on the level of detail you need for the analysis. Get averages and sums for each equipment or for complete production areas considering all the equipment being used within it. Get an accurate comparison of actual vs planned production times in real time. 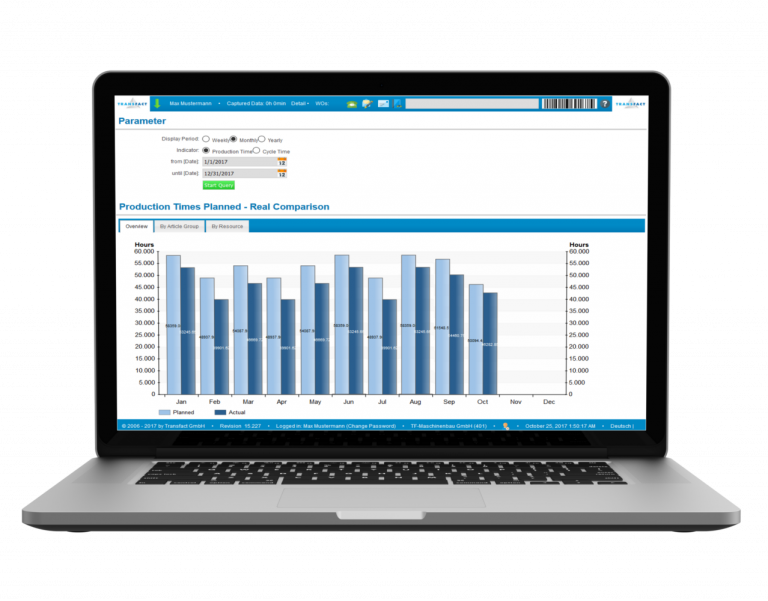 Analyze the comparison for your complete production facility, for each production area or even for each machine and get an overview either by year, by month or by week. Use this tool for both: improving the production times used for planning and scheduling, as well as identifying possible productivity issues. An automatically calculated, organized and structured overview of your production costs. Specifically designed for made-to-order production, the get a comprehensive and detailed calculation of the costs for each production order. 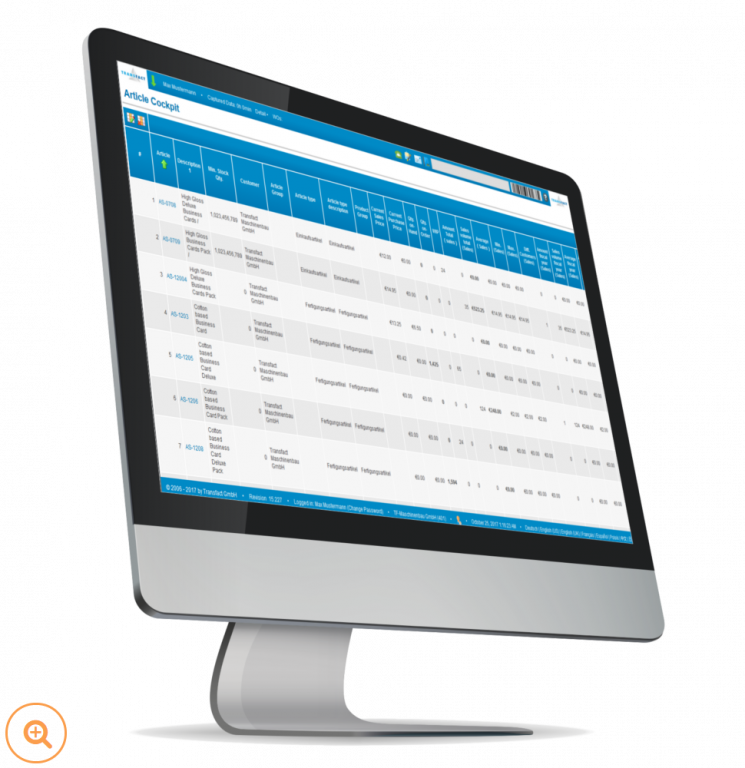 Filter and analyse your results by article, customer, date or article group and get all the information about production times, operator times, material and resource use. In the Transfact System, delivery dates are very closely monitored and tracked, there are numerous warnings and support tools that help you keep your deadlines. This report provides you a graphic summary of the total monetary value of the orders that were completed late. It also provides the overall average number of days the orders were late. The filters allow you to visualize the report by week, by month or by year as well as drill down to specific articles, article groups, customers or a specific period. The Transfact article cockpit provides a very comprehensive overview of all your article data available in the system. The overview can be configured to show exactly the article data that each user needs and it has integrated filters that make it easier to find the data you are looking for. Display, review and export your data in an organised and adjustable structure. Use the Transfact Article Cockpit to validate the accuracy of your article data. The supplier evaluation automatically calculates an A, B or C grade for suppliers based on their on time delivery, quality and quantity reliability. The evaluation considers all deliveries in the past 3 years for the average grade to increase the reliability of the grades assigned. Here too, the system allows you to drill down into the details and analyze each of the purchase orders and deliveries that make up the general evaluation.